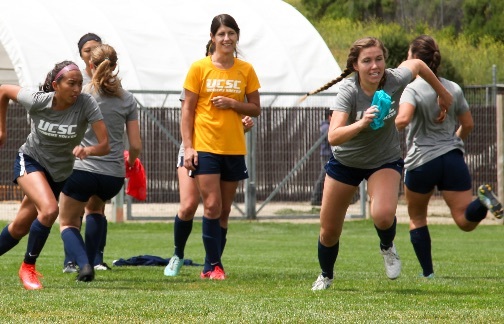 UC Santa Cruz has 15 teams competing in the NCAA's Division III, including women's soccer. UC Santa Cruz students showed strong support for the campus’s NCAA Division III athletics program, with 63 percent of voting undergraduates signaling that they would be willing to establish a new fee. A record 43 percent of undergraduates voted in this year’s election. Of those, 63 percent were in favor of establishing a new undergraduate fee that would be approximately $90 per student per quarter. Undergraduate students will vote in spring 2017 on establishing a new student fee. Additionally, two committees—one comprised of faculty and one comprised of UC Santa Cruz Foundation board members and alumni councilors—are looking at sustainable funding models for the program. More than 6,000 undergraduate students casts votes in the election that ran from May 11–17. Full election results can be viewed online later this week. The opinion poll asked students whether they would support a new student fee of about $90 per quarter ($270 per year) to support the current NCAA program at UC Santa Cruz. UC Santa Cruz leadership determined in 2014 that it would not be sustainable to fund the program for the years to come and offered funding through 2016–17 so that the program could try to transition to financial support from student fees.